As I mentioned last week, in exactly one more week I'll be in New York as a guest of Brizo faucets. Brizo is flying me and 18 other designer/ bloggers to attend a product education seminar and a Fashion Week runway show by the designer Jason Wu. This promises to be an event that will live on in story and myth for centuries, and that's no exaggeration. In the interest of keeping the FCC off my back I need to state loudly and clearly that Brizo is picking up the tab for this excursion. And to that I'd like to add thank God for Brizo. My itinerary arrived yesterday and as was the case last September when I went to this same event, I'll be spending the weekend at the 70 Park Avenue Hotel in Manhattan's Murray Hill neighborhood. The hotel, as the name would suggest, is on Park Avenue at 38th Street. Four blocks to the north is New York's famed Grand Central Terminal. Inside the Terminal, on the east balcony, is Charlie Palmer's Métrazur. My fellow attendees at the Brizo event and I will be dining at Métrazur next Thursday night. I was looking over the menu last night and I cannot wait to try the place. The restaurant looks incredible, and it's impossible to beat the location. 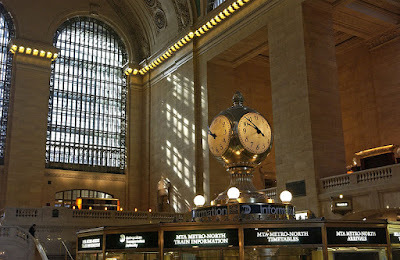 Grand Central Terminal is another one of New York's great buildings. By extension, that makes it one of the world's great buildings. If I were to walk out the front door of the hotel where I'll be and stand in the middle of Park Avenue then look north, here's what I'd see. Grand Central Terminal sits in the middle of Park Avenue at 42nd Street. Since the building opened in 1913 (after a ten year construction), The south facade has risen up from Park Avenue like a Beaux-Arts mirage. From the outside, you'd never imagine that underneath that building is the worlds largest train station. 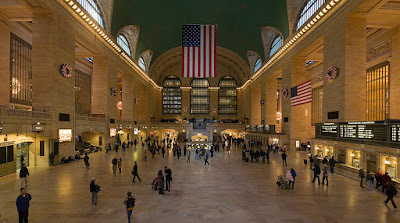 Grand Central Terminal occupies 48 acres in total. Now that, is a big building. At the top of the south facade is the station's clock. At 13 feet in circumference, it's also the largest example of Tiffany glass in the world. 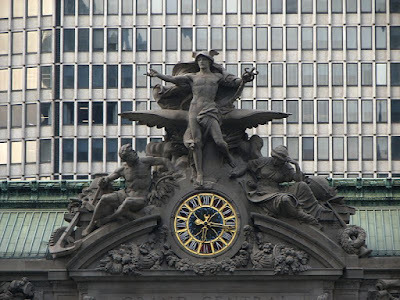 Surrounding the clock is a statue depicting Mercury with Minerva and Hercules alongside him. To give you a sense of the scale, zoom in on the Terminal's facade in the Street View above. That statuary and clock grouping is 48 feet high. There's a great blog called Which Yet Survive, and it's all about Manhattan statuary. Here's a great post about the Mercury statue if you'd like to read more about it. The terminal was nearly torn down in 1968 and threats to demolish it led to the establishment of the US historical preservation movement. The drive to save Grand Central Terminal .enlisted some pretty high profile supporters, most notably Jacqueline Kennedy-Onassis. Once saved, the building languished in a state of filthy disrepair for decades. The enormous windows were so caked with grime that no light passed through them. 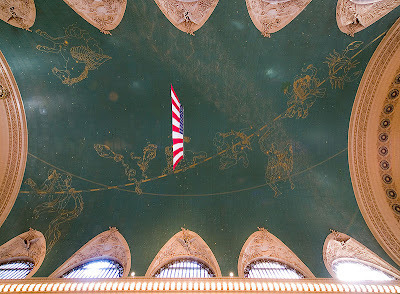 The incredible ceiling had become so coated with the residue of 70 years of tobacco smoke that the mural of the constellations couldn't be seen. The building was restored to its original glory in 1998, after a four-year renovation. It's an incredible structure, and it's most definitely one that's etched into the American psyche. The 80,000 square foot main concourse has been in more movies than just about any other location in the city. From North by Northwest to I am Legend, there always seems to be a good excuse to film inside that building. Dreamworks even worked in an animated version of it in the movie Madagascar. So the next time you're in New York, or maybe it'll be the first time you're in New York, it doesn't really matter either way. What does matter is that you find your way to Park and 42nd. Once inside the building, walk into the main concourse and just look up. Spin in a slow circle if you want to, I always do. Just look up into that cerulean sky and marvel. Who cares that everybody'll know you're a tourist? You'll never see any of them again anyhow. So as you're doing your slow spin, thank the Vanderbilts for leaving behind such an incredible legacy. But wait! There's more! After you're done having a moment under those 125 foot high ceilings, find this passage just off the main concourse. The area under that arch has the most amazing acoustics you'll ever experience. It's called the Whispering Gallery, and this intrepid Manhattan blogger describes it better than I can. 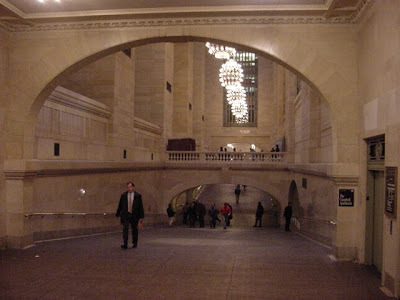 Grand Central Station's Hidden Acoustical Wonder. Amazing! All images and a handful of the factoids about the terminal are from Wikipedia. I'm counting the days... soon to be counting the hours! Me too Pam, me too. Remind me to take you guys down to the Whispering Gallery before dinner next Thursday.